Today we gather here to celebrate Martin Luther King Day. We celebrate an enchanted life of celebration, a life that inspires generations and generations to come. We celebrate an everlasting spirit of enlightening, a spirit that transcends the fear within in commanding respect and longing equal rights. We celebrate a mighty power in a human being, a power not derived from wealth or privilege, not from Royal heritage or government post, not even from a public election. A power emerges from the conviction and dedication to the unconditional love for the human race. A power that is deeply rooted in each and everyone of us that when it is finally being ignited there is no mountain of injustice that can not be flattened and removed. We are here to let you know, Dr. King, that your Dream is being carried on not just in the hills of Georgia and the state of Mississippi but everywhere in this world; that your call to Let Freedom Ring is not just echoed in the hilltops of New Hampshire, the mountains of New York, the Alleghenies of Pennsylvania, the Rockies of Colorado, and the slopes of California, but is being responded in chorus in the mountains of Himalayan, in the valleys of Danube, along the shore of the pacific ocean, and in the heart of the Los Llanos plains. People, people are rising up in pride and dignity. People are saying No to tyranny and reign of terror. But, the ultimate victory for the peace-loving humanity is far from being claimed. In those states of totalitarian, laws are used to defend dictatorships instead of protect the people; peaceful calls for harmony are being suppressed with brutality instead of being cherished; human rights champions are being imprisoned instead of being praised. Even in this great nation of George Washington, Thomas Jefferson, Abraham Lincoln, and you, Dr. Martin Luther King, too often democracy is comprised to special interests, too often the so-called ideology overshadows the commitment to put the people first. When we pay tribute to Dr. Martin Luther King on this special day, the best gift we can present to him is to remind ourselves about his dream, to continue his cause each and every day until there is no one in this world finds himself an exile in his own land. 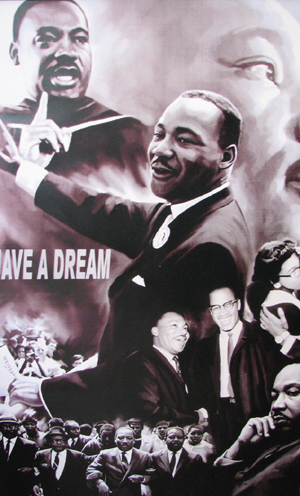 We have a dream: let freedom ring from every corner in this world! I was hoping the year, or the decade for that matter, would end on a happy note. So we joined two other families on a visit to the Disney World, trying, at least for me, to escape facing the depression amounted from reflecting the decade about to end. Then on December 25, Christmas day, I learned, from my iPhone, that a Beijing court has sentenced Chinese writer Liu Xiaobo to 11-years in prison and “two years’ deprivation of political rights” for subversion in his writings. By now, you have probably noticed that I am someone who is wholeheartedly longing for a peaceful world, a world that each member’s life and rights are respected. But my dream had been shattered time and time again in the 2000s. This verdict on Liu had just added another blow. No. The Y2K computer black-out did not occur. In fact, the decade started rather smoothly. But at the end, it has been covered with the darkest clouds in recent history. Since the rectification of the Declaration of Universal Human Rights in 1948, we had witnessed a steady progress in accepting the universal values of respecting individual rights. The fall of the Berlin Wall in 1989 anchored a monumental victory for the pursuit of Human Rights in the world. Looking back this decade, however, we saw perhaps the greatest regress since the end of the World War II. The horrendous 102 minutes of September 11, 2001 that took 2752 lives of innocent people changed everything, slapped the face of every peace loving soul. Not only the families of the victims will forever dealing with the grieves of the losses of their loved ones, the heroes who bravely responded the attacks are now suffering lung ailments, cancers and other fatal illnesses. This is how The Art of War, a book by Sun Tzu written some 2500 years ago, begins. Responsi­ble nations in recent history have in general approached wars with prudence and deliberation, because, as Sun Tzu pointed, it is a matter of life and death. However, the processes of engaging and invoking wars in this decade were rather lax, and the lack of sufficient inquiries were apparent. The world has been paying great prices. According to icasualties.org, the coalition military fatalities in the Iraq war amounts 4689. US alone lost 4371 service men and women. And the number of Iraqi civilians deaths is near ten folds, at a staggering sum of 46783. Political and religious oppression around the world worsened, and oppositions from the free world weakened. According to the Prisoner Database compiled at the Dui Hua Foundation, there are 19935 Chinese political and religious prisoners as of September 30, 2009. Individuals who peacefully exercised their rights to freedom of expression, assembly and association remained at high risk of harassment, house arrest, arbitrary detention, and torture and other ill-treatment. Family members of human rights activists, including children, were increasingly targeted by the authorities, including being subjected to long-term house arrest and harassment by security forces. Lawyers who took on sensitive cases were also at risk; several had their licences suspended, and others lost their jobs. Some lawyers were specifically warned by the authorities not to take on sensitive cases, including cases of Tibetans arrested during the unrest in Tibetan areas and Falun Gong practitioners. – Amnesty International. The number of Political Prisoners in Burma has surged to 2250 by the end of September, 2009. Burma’s military government has more than doubled the number of political prisoners in the past two years, including more than a hundred imprisoned in recent months, Human Rights Watch said in its September report. Massive human rights violations take place in nearly every part of the world in this decade. In addition to the two countries mentioned above, Equatorial Guinea, Libya, North Korea, Somalia, Sudan, Turkmenistan, Uzbekistan, Belarus, Chad, Cuba, Eritrea, Laos, Saudi Arabia, Syria, and Zimbabwe all recorded widespread human rights violations. What’s troubling is that we have seen a disturbing trend since the end of the cold war, particularly in this decade. Talks on human rights have become more and more political tactics, instead of unshakable principles. We selectively leverage them only to serve as instant justifications to our immediate policies. We choose becoming silent when we fear it might jeopardize our trade talks. We show indifference to the victims who are longing desperately our leadership and support, when we seek economic cooperation from the regimes who are the source of the oppression. And Mr. Feng Zhenghu is still living on a bench in Tokyo’s Narita International Airport, waiting a permission to go home. I don’t even want to start discussing the financial melt down. While in the Disney Parks, watching people from all over the world celebrating together, hearing songs beautifully advancing the messages of peace and love, I couldn’t help but ask myself: wouldn’t it be wonderful that the world we living in becomes a Disney park? Peace, in the sense of the absence of war, is of little value to someone who is dying of hunger or cold. It will not remove the pain of torture inflicted on a prisoner of conscience. It does not comfort those who have lost their loved ones in floods caused by senseless deforestation in a neighboring country. Peace can only last where human rights are respected, where the people are fed, and where individuals and nations are free. There ware gatherings yesterday in various parts of the world commemorating 20th anniversary of the conferment of the Nobel Peace Prize to the Dalai Lama. Reading these news brings back profound memories of my first acquaintance with His Holiness. It was in the fall of 1989. The Chinese Independent Union at the campus of UW-Madison extended our invitation to His Holiness, the 14th Dalai Lama. This gesture alone was of great significance, because all of us grew up brainwashed by the propaganda that views the Dalai Lama a separatist and traitor. This territory, as I was told, that a large group of students from mainland China openly embracing His Holiness was never acrossed before. Soon we received the response from his office stating that His Holiness is delighted to have an open dialog with the Chines tudents. This was the second time the Dalai Lama visited Madison. 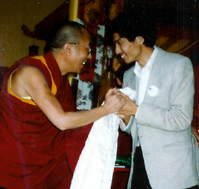 In 1981, His Holiness came to Madison to perform a special religious ceremony for world peace in the Deer Park Buddhist Center, about 10 miles south of Madison. The Center, opened in 1975, is the only full-scale Buddhist monastery and teaching center in the Midwest. Oh no, I said to myself, we are in trouble! Because it was in Tibetan. Just as I became increasingly nervous, we heard His Holiness explaining, in Chinese, that it is the tradition to show respect to the culture and religion to begin a speech in Tibetan. Sigh. And, His Holines told us, it is to show respect to us to say a few words in Chinese, now starting in English. By that time, the place became alive. His kindness just brought us closer to him. In the one and half hour address, His Holiness expressed deep sadness towards the tragedy took place in June in China, strongly condemned the Beijing regime’s oppression of the students peaceful demonstration. We were still at a stage of heartbreaking of the massacre. Many of us started sobbing. Then His Holiness discussed the human rights situation in Tibet in the past 40 years, and his love to peace, and to the Chinese people, stressed the way to resolve conflict should be through dialogue and discussion. It was heartwarming and enlightening. Many of us began to understand the suffer the Tibetan people had endured, and to realize that it was in our common interests to defend human rights and pursue justice. 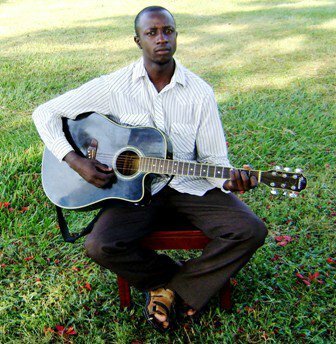 With his ever-hopeful and forward-looking perspective, we all felt the encouragement and hope within. It was an unforgettable get-together. Many participants expressed their gratification for the opportunity. I was extremely thankful. The story just got better. A coupe of days later, while His Holiness was still in Madison, we heard the news that the Dalai Lama was the finalist of the 1989 Nobel Peace Prize. 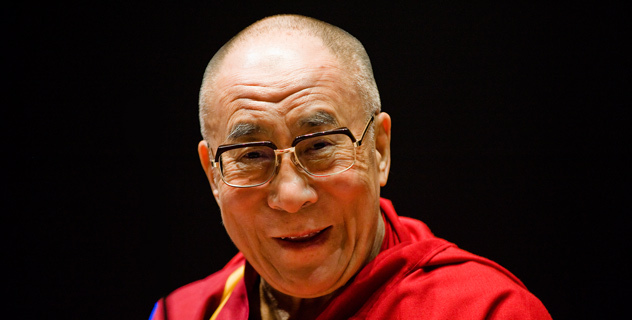 We were overjoyed, and the news that His Holiness was actually in Madison flew quickly. I got a call from our Chancellor Donna Shalala, now the president of the university of Miami. She said the university would like to host a ceremony for the Dalai Lama. I, of course, was completely thrilled. The creation of this Declaration marked the beginning of new era: the recognition of the universality of the inherent dignity and of the equal and inalienable rights of all members of the human family. 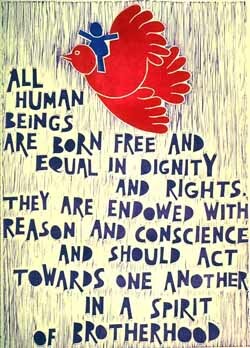 61 years late on this date, can we declare these universal values are now embraced and celebrated in every corner of the world? Can we relax our pursuit for the cause of human rights because we think it is improved? Well, we turn on the TV, we open the new paper, we browse the Internet – even the most abstractive summaries will demand a dedicated consumption, and, by no means, these brief headliners can even scratch the surface of the real happenings. The UN has set the focus for Human Rights Day 2009 on non-discrimination. We certainly applause this noble cause for its recognition of the existence of discrimination and dedication to end such shameful acts. But, not for single moment should we lose sights of the oppression, persecution, and abuse that people under repressive regimes suffer each day. In the Amnesty International Report 2009, it is stated that “IT’S NOT JUST THE ECONOMY, IT’S A HUMAN RIGHTS CRISIS”. I have place a link to each region above, and hope you’ll spend some time to read through them. On March 31, U.S. Secretary of State Hillary Rodham Clinton and U.S. Permanent Representative to the UN Ambassador Susan Rice announced that the United States will seek a seat this year on the United Nations Human Rights Council with the goal of working to make it a more effective body to promote and protect human rights. On April 27, 2009, the State Department released the US Human Rights Commitments and Pledges. This is certainly an encouraging step forward for the administration in demonstrating its commitments in defending the universality of human rights. We hope these commitments become the guiding core principles in our policy making process, whether it’s foreign relations, or trade practices. We must urge the administration to keep its Pledges. 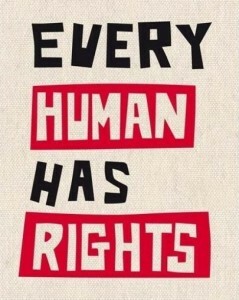 And we should never become silence on human rights abuses. Hanging Christmas lights with Macy. It’s a bit chilly, but we are having a lots of fun. Seeing her joyfully examining the twinkling display, my mind keeps showing this strange, remote scene of a man sitting on a bench in an airport hall, waiting to be allowed to go home. 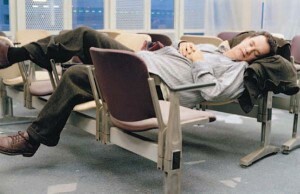 Tom Hanks in "The Terminal"
He is a man caught between two countries, a political protester who has stubbornly steeled himself inside the sterile purgatory of Tokyo’s Narita International Airport. Each day, Feng Zhenghu sits on a bench in front of the Japanese customs booths, calmly looking on as tens of thousands of arriving passengers pass him by, resigning himself to residence in a diplomatic no-man’s land. He refuses to pass through government customs because that would mean entering Japan – something Feng has decided he simply will not do. He wants to go home to China. Eight times since June, the 55-year-old activist has been rebuffed by Chinese officials in attempts to reenter his homeland. On four occasions, airlines in Japan didn’t allow him to board. On four others, he got as far as Shanghai’s Pudong International Airport before being dispatched back to Tokyo. 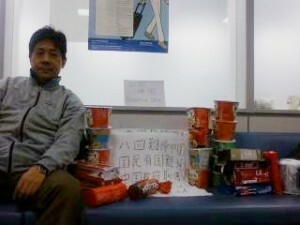 During the last go-round Nov. 2, a defiant Feng drew the line: Arriving back at Narita, he refused to enter the country. Feng, an economist turned human rights author and blogger, was sentenced in 2000 to three years in a Chinese prison for writing a book that he said criticized Chinese regulations against foreign company investment. He also believes a speech he once gave criticizing the 1989 Tiananmen Square crackdown is being held against him. Still, he says, officials cannot banish him on mere pretense. Speaking on his cellphone recently, Feng said he would prefer to languish in a Chinese jail than live as a free man in Japan or anywhere else. Although he is angry at his government, Feng misses his homeland – his family, friends, the feel of the place he has spent most of his life. Feng’s plight is reminiscent of the Tom Hanks character in Steven Spielberg’s 2004 film, “The Terminal.’’ But this unlikely sojourner has no access to food courts or hot showers. He has kept a lonely vigil at the south arrival wing of Narita’s hyper-busy Terminal One. Many workers and travelers don’t even know he’s there, staging a protest in a nation where, traditionally, few people question authority. Now you get the picture. You must be wondering, just as I have been wondering ever since I heard the story 3 weeks ago, how is this possibly happening in real life? I don’t know Mr. Feng. I could only imagine how devastated his loved ones at home mus be, and how much Feng wants to be with his son or daughter. As the World Human Rights Day is approaching, the mere fact that someone does not even have the bare right to return his own home is a disgrace to the entire mankind. All Mr. Feng just wants is to go home so he too could hang up Christmas lights with his kid! This is Bob’s favorite phrase. Bob is very proud of his “patterned invention”. What does it mean? You ask. Bob Hall is a dear friend. Our relationship started as business partners dates back to the mid 90s. But soon we discovered that the foundation for our long lasting friendship is our endured respect for each other, and expanded respect to all human beings. Many businesses Bob helped taking off are still flying high. His failure of locking up a lucrative package with any of them leaves him with no equity for his contribution. I told him, jokingly, “You are a bad business man.” “I am good to them,” he confessed. But, it really hasn’t bothered him that much, because there is something much more important than being successful in personal business, something occupies a great deal of the capacity in his daily life, that is the belief embedded in the concept of The TYGER TEAM: All members of the human family are with “the inherent dignity and of the equal and inalienable rights”. Alright, one might argue there is nothing new to this (however, you ought to admit the acronym is pretty clever). It was certainly implied in the Declaration of Independence when Thomas Jefferson wrote down “All men are created equal”. The ultimate universal principle revolves around the truth that all men under heaven are created equal. But, it took “four score and seven years” and the extraordinary leadership of Abraham Lincoln to end slavery. It took almost 2 centuries of generations of civil rights movement to end racial segregation. The “I Have a Dream” address delivered by Dr. Martin Luther King marked the brightest spotlight in this journey. The vision and relentless struggle the great men and women in America demonstrated in defending human rights has inspired the entire world. Now even in the most repressive regions the outcries for human rights, justice, and equality are loud and clear. These values are no longer just the American values. They are UNIVERSAL VALUES. So, “let us celebrate!” as Bob often says. Yes, let’s celebrate our human family of great diversity with rich heritages; let’s celebrate who we are and what we are with dignity, a sense of purpose, and respect to others; let’s celebrate our dedication to let freedom ring from every corner in the world.